Myopia, also known as shortsightedness, is one of the most common forms of vision problem. For the most part, people with myopia have the ability to see objects up close very well, but have a hard time seeing objects in the distance. Shortsighted people typically have difficulty reading signs and seeing objects clearly from a distance, but can see well enough for close tasks, like computers and reading. Other symptoms of shortsightedness include eye strain, headaches and squinting. In some cases, eye strain after participating in sports, watching TV or when driving can also be a sign of untreated myopia. 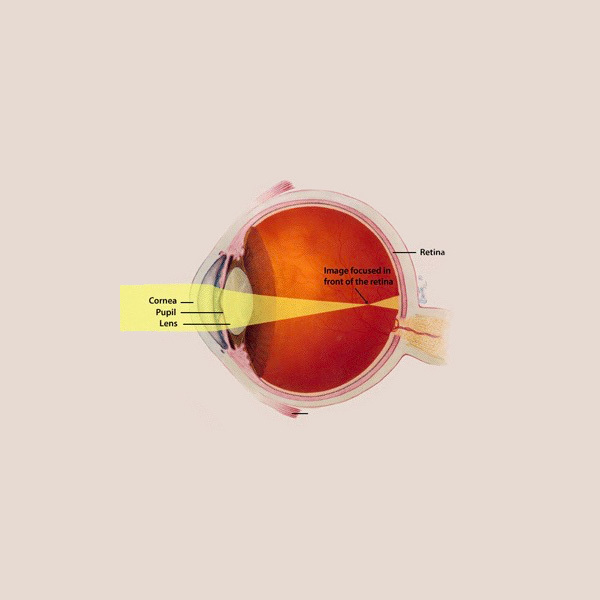 Myopia occurs when rays of light entering the eyes are bent by the lens as though they were coming to a focus in front of the retina, instead of falling directly upon it. Not surprisingly, a shortsighted eye is often longer than average, or the lens is more steeply curved and tends to bend the incoming light to an excessive degree. Myopia is rarely present at birth, but develops during childhood and adolescence. It has a tendency to run in families meaning the children of shortsighted parents are at a higher risk of developing the problem as they grow compared to children with no family history. In the majority of cases, myopia stabilises sometime in early adulthood, but there is still the chance that it will get worse with age. In recent decades, there has been an increase in the incidence of myopia in the developed world. The exact reason for this jump is, as yet, unknown. However, it is thought that environmental factors, such as long periods of close work and intensive schooling early in life, may also play a role in the development of shortsightedness. Myopia is usually detected during a regular eye exam with the same techniques and instruments that are used for detecting astigmatism and longsightedness. Your optometrist can estimate the amount of shortsightedness present by using a retinoscope. This procedure involves introducing different lenses in front of the eye while shining light in at the same time. By observing how the light behaves when reflected in the patient’s pupil with different lenses, myopia can be diagnosed and measured. Many optometrists supplement, or replace, the retinoscope with instruments that are automated and provide a quicker way to test. However, whichever test is done, the optometrist will refine any preliminary findings with a detailed manual test method called refraction before giving you a lens prescription. Myopia can be treated by wearing glasses, or contact lenses, which change the way rays of light are bent when entering the eye. Glasses, or contact lenses, with a minus powered prescription lens are used to correct shortsightedness. You might need to wear them only at certain times, like driving, watching TV or at school, or all of the time if you are very shortsighted. In many cases, LASIK refractive surgery can also correct shortsightedness, and may eliminate the need to wear glasses or contact lenses altogether. With more cases of shortsightedness being noted in recent decades, there has been increasing interest in developing ways to control myopia progression during childhood. Bifocal or multifocal lenses, rigid contact lenses(ortho-K) and more recently Atropine 0.01% eye drops are sometimes used by optometrists as a means of minimising the amount of myopia a child may develop once it has been diagnosed.